This is a rather small alocasia, with leaves about 6 inches long. 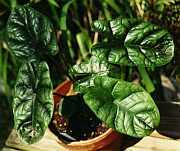 The veins on the leaves are heavily depressed, giving it a "puckered" appearance. 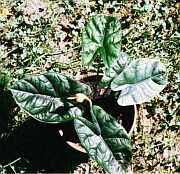 Leaves and petioles are bright green, acquiring a slight grey/bluish tint with age. Despite (or maybe because of ?-) being available in the horticultural trade, it has not been described [P.Boyce, pers. comm]. The inflorescence on this plant is rather insignificant, and has not produced any viable seed for me. Not a big surprise, considering that nothing else bloomed at the time.